Was it beef or was it venison? I don’t know but it was good. Some people said it was venison and some beef, and I have to tell you sometimes I wanted it to be venison and sometimes I wanted it to be beef, but it was not labeled and for the life of me I cannot remember whether those were venison or beef steaks I cut up to make jerky. 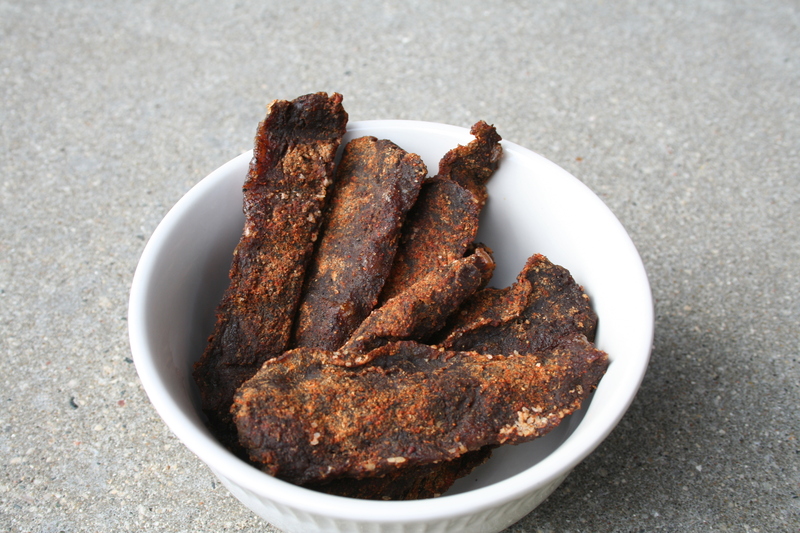 But whatever they were they got me hooked, jerky is going to be an fascination until I can get it just right, every time in whatever flavor I want. So there will be more jerky posts, probably even some this weekend. I started out by cutting my steaks up into about quarter inch this pieces of meat at a 30° angle across the grain of the meat. This was fairly easy to do and using a larger than necessary knife made it even simpler. 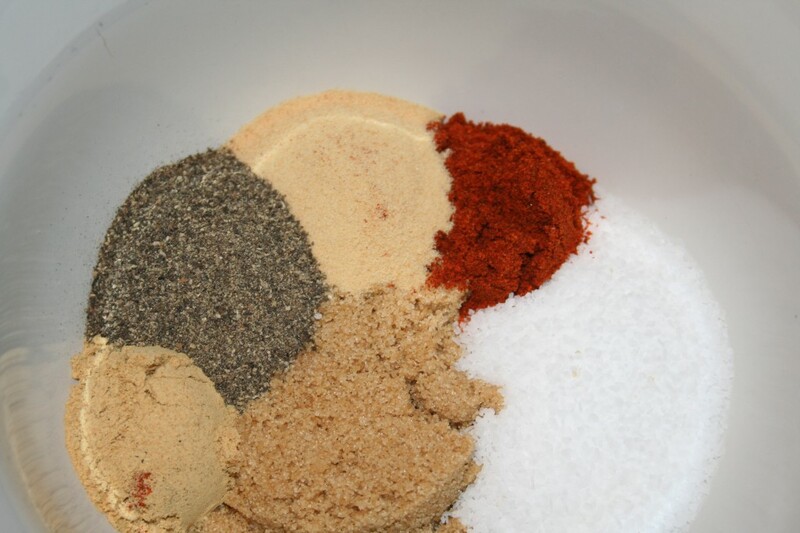 Once the meat was cut I mixed together a rub as follows. Blend together all ingredients in a small bowl being sure to get any clumps out of the brown sugar. Once the rub was mixed together I then rubbed the rub into the meat, this amount of rub is good for about 1 1/2 pounds of meat. I then placed it on the smoker with NO water in the water pan at 155°F for 5 hours over a blend of hickory and mesquite using my PID controlled electric smoker. Using the propane would have probably been too moist to get good jerky and the charcoal might have been a little tricky to maintain that temperature for such a long period of time. The electric with the PID controller is just easy. 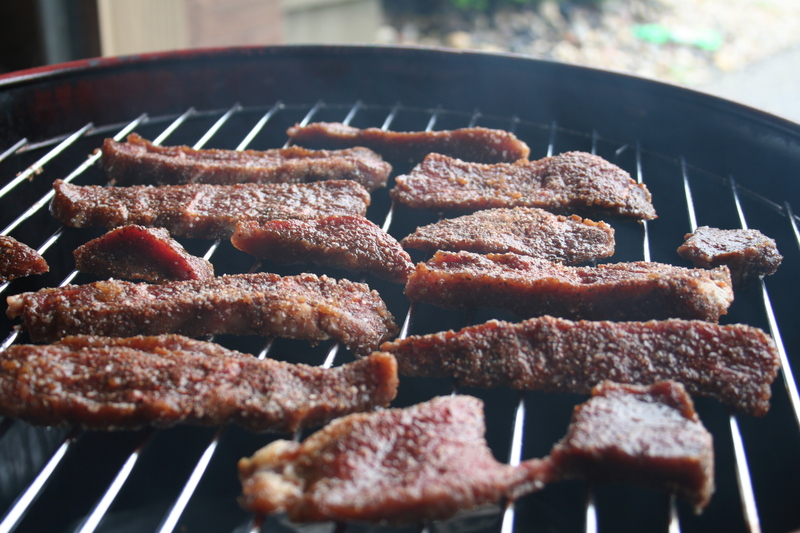 At this point it was still a little moist in the middle but chewy and very jerky like, it was really good. Even as mystery meat the reviews have been good, people have liked it, most importantly I liked it so I will be making more jerky and posting about it as I learn new things.